With the season of colds and flu upon us, we all have a favourite comforting dish that makes us feel better. The Vegetarian Society asked its members and supporters for their go-to culinary hugs and soothers and the replies ranged from hot toddies with ginger and chilli, to stews, spicy curries and hearty soups, but one item kept cropping up: people wished they had a comforting noodle broth which could nurse them through the sniffles. So the Vegetarian Society has created a warming ‘Comfort Soup’ recipe packed with goodness. 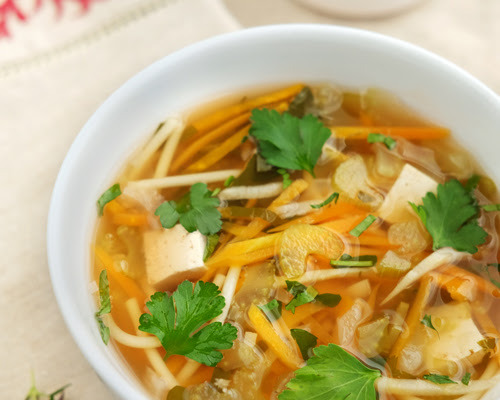 They have used ingredients previously tested by scientists in a study of noodle soup, which showed that many of these vegetables and herbs were effective in reducing inflammation associated with having a cold. 1. Put the onion, celery, parsley stalks, carrot, parsnip, swede, sweet potato, tomatoes or juice, garlic, tofu or Quorn into a large saucepan and cover with 1.75 litres (3 pints) of cold water. 2. Add the bay leaves, thyme or mixed herbs and season generously with black pepper. 3. Bring the pan to boil and simmer on a low heat for 20 minutes. 4. Break the spaghetti into 5cm lengths and add to the soup, cook until tender. 6. Garnish with parsley leaves and serve.